CIRCA 1918 - Soldiers unload and stack bread; one man excitedly eats a loaf. 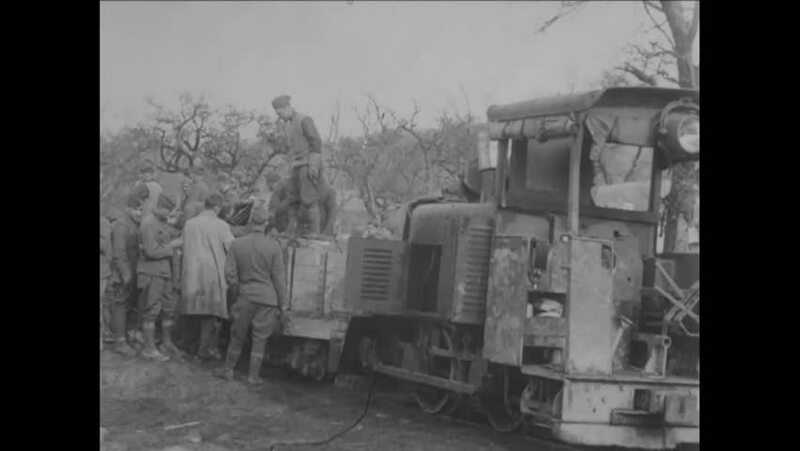 hd01:12CIRCA 1919 - American soldiers load freight cars in Coblenz, Germany. hd01:09CIRCA 1918 - The 102nd and the 103rd Field Artillery units enter Mouilly and their horses drink and soldiers cook and eat in France in World War 1.
hd01:33CIRCA 1918 - Soldiers drive tanks and artillery vehicles before the St. Mihiel offensive in France during WWI. hd01:15CIRCA 1918 - Allied troops celebrate the armistice in the field with music and dancing. hd00:47CIRCA 1950s - Roadbuilding and and trucking and bussing are shown as well as paramedics and an ambulance at the scene of an automobile accident. hd00:34CIRCA 1918 - A busy port is seen in Vladivostok. hd01:06CIRCA 1950s - General MacArthur is cheered by a crowd on stage where he gives a speech in the 1950s. hd01:37CIRCA 1940s - The rubble of bombed buildings at the edge of the British sector of Berlin, Germany after WWII.